Cycling figures are estimates as they were part of the 'walk in & out' on two days. Apart from last Sunday which cold, wet and pretty miserable (typical Scottish summer, in our experience) the rest of the week was wall-to-wall hot sunshine. 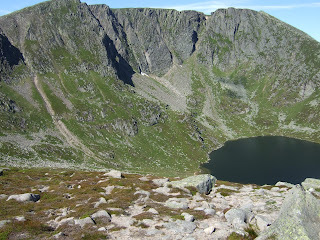 Some days we did only 1 Munro (Mount Keen) but on two other consecutive 8 hour days we managed a total of 11 (Lochnagar and the other 4 around Glen Muick and the 6 on the east side of Glen Shee. Away from the Ski Centre the area around Glen Shee is quiet and remote although the mountain hares keep you company, under very watchful eyes. The first few were a bit of a novelty and their number just kept increasing from groups of 3 or 4 then, perhaps, a dozen and finally we saw a groups that must have numbered 50 before it 'exploded' with hares running in all directions. Around Lochnagar we came across several herds of deer but came closest to them walking out along the lochside when 5 stags were within about 25 yards of the busy path, quietly eating and ignoring everything else including us. Altogether a fantastic week and we both needed the 'rest day' on Friday when we travelled back for "Coope's Dozen". If only all training could be like this. "Coope's Dozen" on Saturday and then a fairly quiet week before Borrowdale. After a steady run over Winter Hill in the rain on Saturday morning we headed off to Barcelona on the first flight on Sunday morning for a few days of sunshine and sangria - we didn't touch any sangria but I am sure you know what I mean. Home very early this morning and in time for another run in the rain. 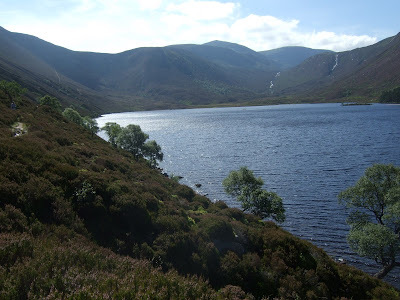 Off to "Royal Deeside" to see if we can find some Munros and Corbetts - probably not much running but lots of climbing - and then back for Coope's Dozen next weekend. Almost all on roads because family commitments last weekend precluded any long outings to any hills. My Dad has been down staying with us and we went down to my brother's at the weekend to celebrate a joint 18th/21st/50th 'birthday'. Back to the track on Tuesday and a Hill Session last night just to make sure it wasn't too easy a week. Last weekend's experiments with alternative food and drink were completely successful. By avoiding the combination of Go Bars and Maxim drink I consumed the required number of calories for a four hour session on Saturday and a 3 hour session on Sunday without any nausea and it was good to be back on Winter Hill for the first time in a while. I am sufficiently happy with these two days to start planning another attempt with confidence that a repeat of last month will be avoided. With no dates available in July I am considering some dates in mid and late August. The initial indications are that mid August is probably not going to work because of holidays and other commitments. The end of August is my least favourite - I would like to get it done earlier because the days are shorter, the bracken is higher and I have to stay injury-free for longer. Family birthdays preclude the possibility of my usual long fell run on Saturday morning so I'll be trying to squeeze in some extra miles every morning, aiming to finish the week with around, or a little short of 70. I hope also to be able to finalise the date of my second attempt so I can get on with making the required arrangements. The end of August seems a long way away but with holidays, our own and others', it will come soon enough.